There are those certain dresses that we can wear as skirts or skirts we can wear as dresses. Let's call them "dirts". Get it? Dresses + skirts = "dirts". Or, you could go with skirts + dresses = "skresses". Whatever floats your metaphorical boat. Anyhoo, I'm not here to argue names. I'm here to tell you that when you find a dirt or skress, you get two potential outfits in one. I came across this Language Los Angeles dress I bought a few years back while I was spring cleaning. I wanted a look that was casual to run around town to do errands but looked cute and kept me comfortable. So I pulled this dress down to my waist, threw on a BCBG tank, FreePeople knit crop sweater, belt and tie up sandals. To remix the entire look, and set my sights on something that takes me from day to date, I wore it like it was meant to be worn, threw on some heels, a Charolette blue knit sweater and cinched it all together with a belt. The top of the dress is straight across, so to give it a sweetheart neckline, I tucked some of the fabric together with a safety pin, and voila! Outfit remixed. Katie - 1, Closet - 0. Bam. Genius. ;) Rock it girl! Love how you paired the belt on top of the blue knit sweater! You truly look great in everything! back in my skank-tastic college days, I've been known to use a skin tight tube top pulled down as a skin tight mini MINI skirt! Great remix, I wonder if I have anything in my close that I can do this with hmmm I'll have to check. LOL! You are so funny!!! Great idea! awesome! didn't expect it to become a skirt :) i love it equally both ways! Love it! I'm dying to know what photo editing software you use! Love it!! I have a skirt that I wear as a top sometimes! Love this color on you! i love your creativity!! great job remixing the dress into 2 different outfits. That's a great idea! I've never even thought of a dress, a certain kind of dress I know, to be worn as a skirt! 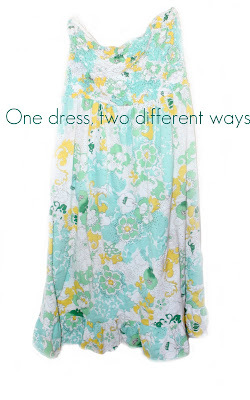 And love the idea of bunching up the top of the dress for you 'date' look. Again, never would have thought of that! Gosh, I am so clueless when it comes to even remixing! You really need a creative mind...where did mine go? As least when it comes to fashion I can't find it! I love anything that can do double duty. This is amazing. What a great idea! Love the new word "dirts" I wear those a lot, know I know their names, love the boho mood on this one, as always you look beautiful! oooohhh i really like it both ways, but i think i like it best as a skirt!! great idea and great styling!! I'm wearing a dirt today! And I love how you created a sweetheart neckline when your wore the dirt as a dress - that's so clever! My friend had a skirt that she let me borrow but had just left it on my bed without explanation. I put it on thinking it was a dress and had no second thoughts. needless to say when I showed her pictures we laughed for a while. I like both ways you styled it! SO springy! Genius!!! You just made me think about spring cleaning my own mess! Ooohh! Your nails match the dress too! Um, love it. The color, the pattern, how you fabulously styled it. You are a rockstar remixer. Awesome. Your blog! It's absolutely lovely. ooh i love it! how genius! your hair is gorgeous!!! what is your daily hair routine? ?